The Mississippi Organ Recovery Agency is a not-for-profit organization. All contributions made in support of organ and tissue donation awareness and/or in the memory of a loved one are tax-deductible to the limits allowable by law. 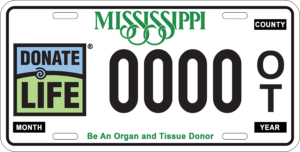 Your contribution or car tag purchase will be used for public education and donor awareness. Please include your name and address, and send your check to the address below. A receipt for your tax-deductible donation will be mailed to you.